One hundred and fifty-four years ago this week, Union troops under General Nathaniel Banks swept across the undulating farm fields of Culpeper County, Virginia. In front of them, in the shadow of Cedar Mountain, General Stonewall Jackson’s Confederate troops fired volley after volley into blue-coated troops wading through corn and wheat. Despite heavy losses, the Yankees kept coming, surging over the Confederate line, momentarily breaking it. At that moment, Jackson rode into the fray and personally rallied his men. The combination of Jackson’s leadership and a well-timed counterattack led by Confederate General A.P. Hill won the day for the Confederates, setting the Yankees on their heels and ushering in a new phase of warfare in Northern Virginia. 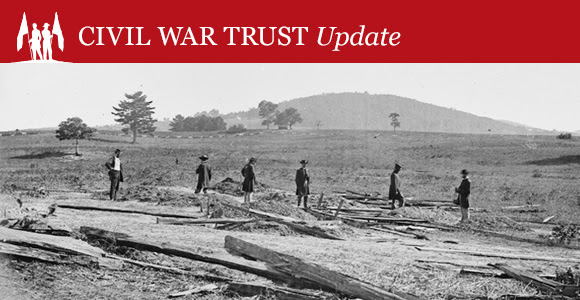 Thanks to your support, 164 acres at Cedar Mountain have been saved by the Civil War Trust, including the site where Stonewall Jackson famously rallied his troops. Today, thanks in large part to the stewardship of our partners at the Friends of Cedar Mountain Battlefield, the battlefield—carefully stewarded by our partners in preservation at the Friends of Cedar Mountain Battlefield—retains many of its wartime characteristics, making it the perfect place to pause and reflect on the sacrifices made by our ancestors 154 years ago this week. Visit the Brandy Station & Cedar Mountain State Park Alliance on Facebook to see photos from the Friends of Cedar Mountain’s anniversary event, and be sure to like the page for more updates on the effort to create a state park in Culpeper County.